This week I want to devote a small post to something very nice and, in some situations, very easy. 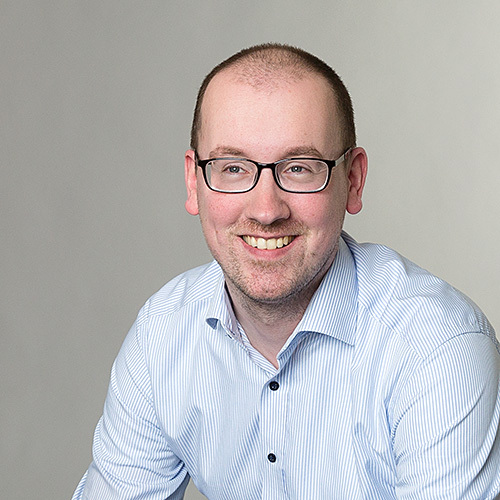 Think about a situation where, in general, applications are user-targeted and only a few exceptions are system-targeted. Usually these targeted systems are then used specifically for that application. So these systems shouldn’t get all the applications (and settings) of every user that logs on, as it might screw-up the specific application. 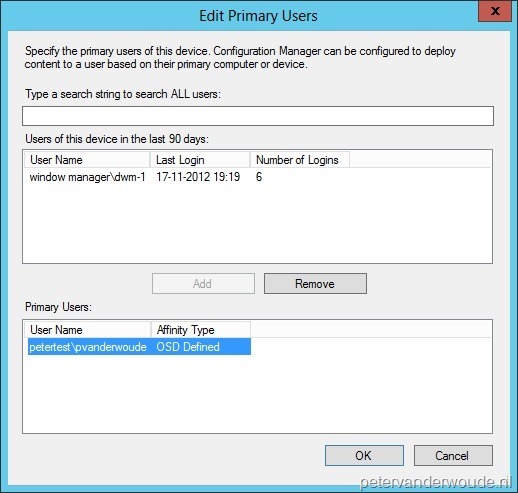 The nice thing is that ConfigMgr 2012, and especially SP1, has a solution for this! 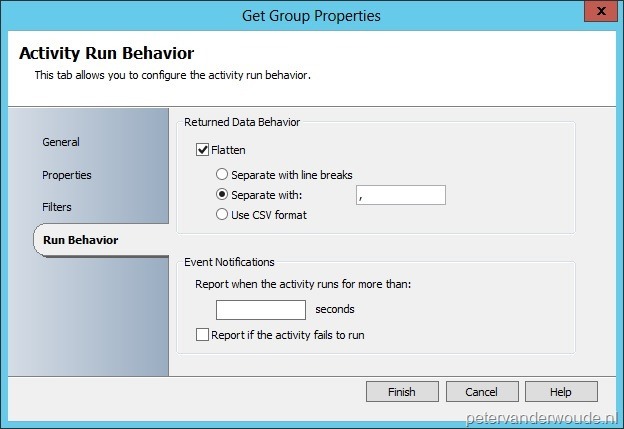 The solution is the new setting Enable user policy on clients. On the General page, fill in with Name <aName> and select Client Policy. 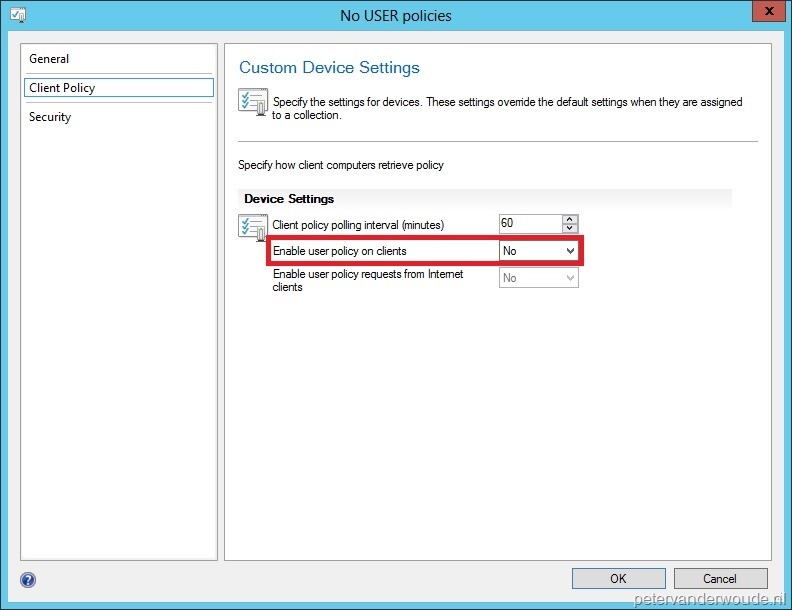 On the Client Policy page, select next to Enable user policy on client No and click Ok. 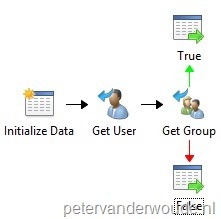 Note: In ConfigMgr 2012 RTM the possible values are True or False. After the deployment of the new Client Settings it is time to take a look at the impact on targeted client(s). The best places to look at this are the log files. During a User Policy Retrieval & Evaluation Cycle the PolicyAgent.log will show that it will skip the request for user policy (see picture). Since ConfigMgr 2012 SP1 this will also disable the ability to install an application from the Application Catalog. In case somebody tries it anyway, the application installation will not start and the PolicySdk.log will show that the user policy is disabled (see picture). 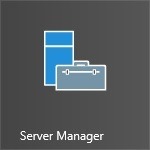 This week I want to devote a post to deploying the Remote Server Administration Tools (RSAT) for Windows 8 using ConfigMgr 2012. Even though the installer is only available as a Windows Update Standalone Installer, in my opinion it should be deployed using the application model in ConfigMgr 2012. 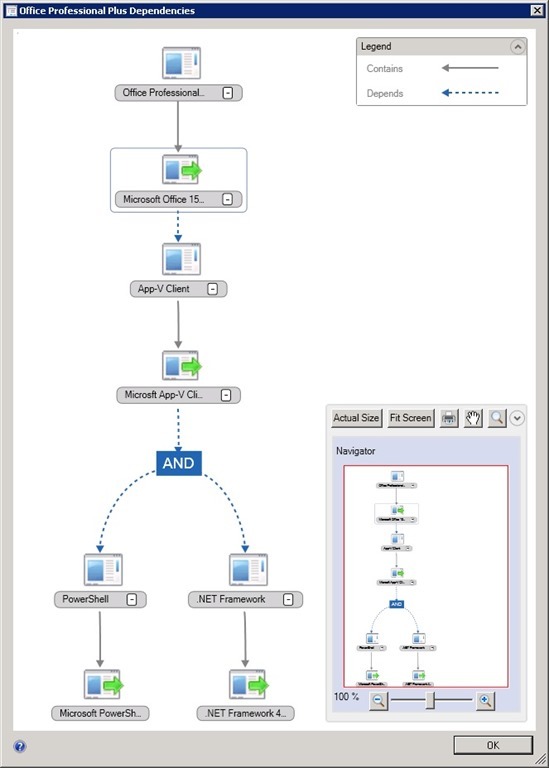 This gives me the possibility to show some basics about the manual applications in ConfigMgr 2012 and more specifically, about the Detection Rules and the Requirements. 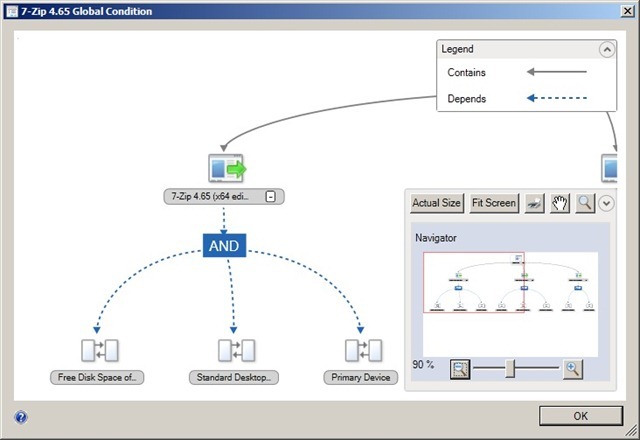 In the Configuration Manager Console, navigate to Software Library > Overview > Application Management > Applications, click Create > Create Application and the Create Application Wizard will show. On the General page, fill in the information about the application and click Next. 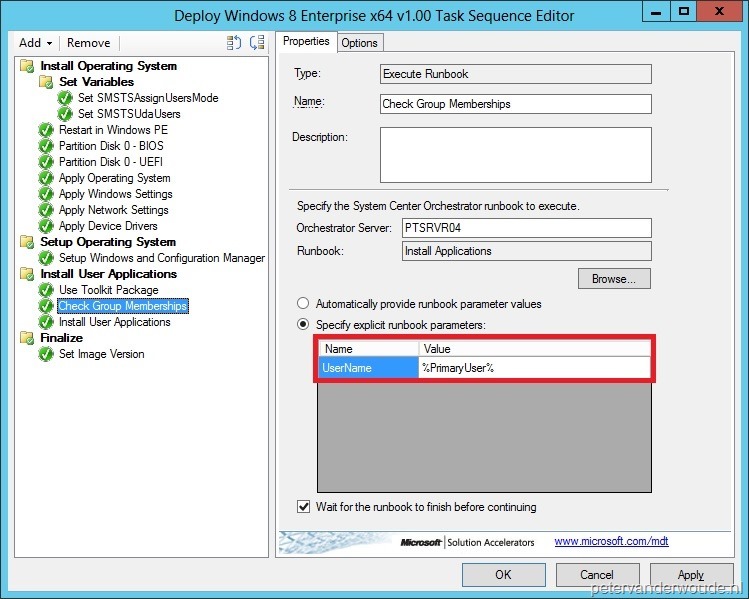 Note: Check the box Allow this application to be installed from the Install Application task sequence action instead of deploying it manually to make it possible to use it in a task sequence. On the Application Catalog page, fill in the information about the application and click Next. On the Deployment Types page, click Add and the Create Deployment Type Wizard will show. 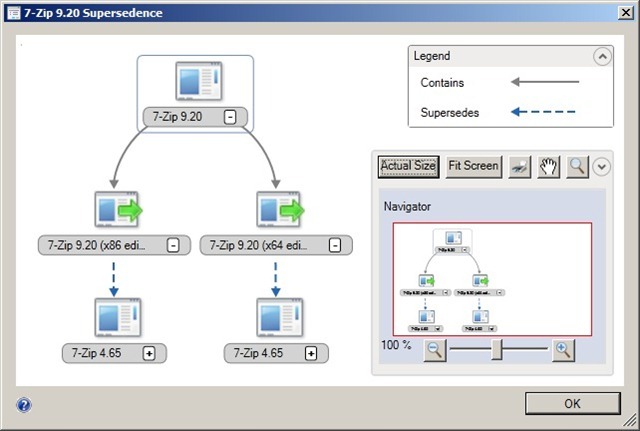 On the General page, select Manually specify the deployment type information and click Next. On the General Information page, fill in the information about the deployment type and click Next. On the Content page, browse to the Content location, use as Installation program wusa.exe Windows6.2-KB2693643-x64.msu /quiet /norestart, use as Uninstall Program wusa.exe /uninstall Windows6.2-KB2693643-x64.msu /quiet /norestart and click Next. Select Add Clause… and the Detection Rule popup will show (see picture). 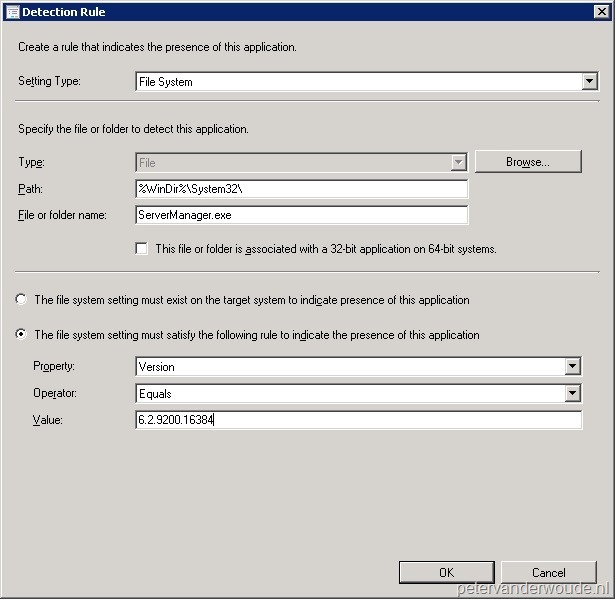 On the Detection Rule Popup, select as Setting Type File System, fill in as Path %WinDir%\System32\, fill in as File or folder name ServerManager.exe, select The file system setting must satisfy the following rule to indicate the presence of this application, select as Property Version, select as Operator Equals, fill in as Value 6.2.9200.16384 and click Ok. Select Use a custom script to detect the presence of this deployment type, click Edit and the Script Editor popup will show (see picture). On the Script Editor popup select as Script Type VBScript, use the follow script as Script Contents and click Ok.
Back on the Detection Method page click Next. On the User Experience page, select the wanted experience settings and click Next. 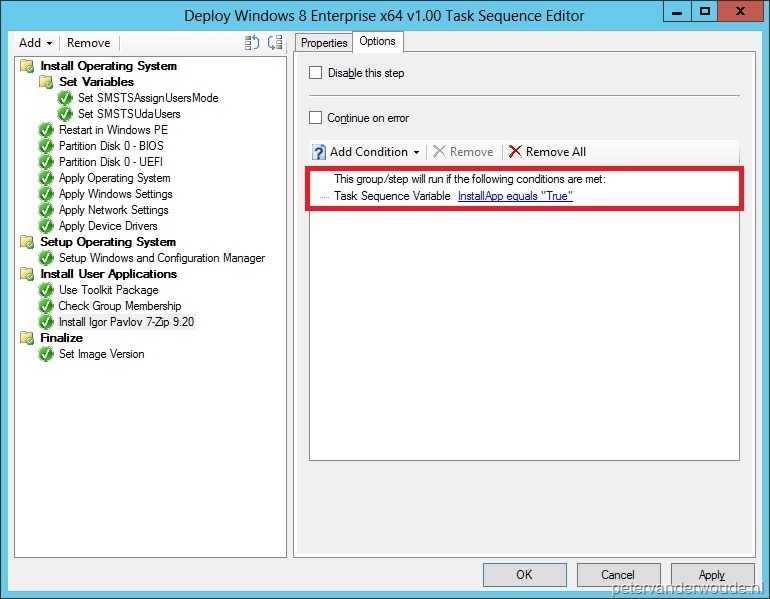 Note: Select as Installation behavior Install for system if resource is device; otherwise install for user and select as Logon requirements Whether or not a user is logged on to make it possible to use it in a task sequence. On the Requirements page, click Add and the Create Requirement popup will show (see picture). 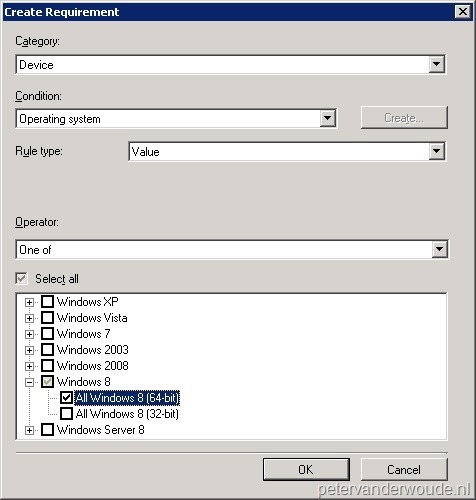 On the Create Requirement popup select as Categorie Device, select as Condition Operating System, select as Rule Type Value, select as Operator One of, select All Windows 8 (64-bit) and click Ok.
Back on the Requirements page click Next. On the Dependencies page click Next. On the Summery page click Next. Back on the Deployment Types page click Next. Note: To also deploy the 32-bit version of the Remote Server Administration Tools repeat the Deployment Type steps and only change the logical things on the Content page and the Requirements page. In the Configuration Manager Console, navigate to Software Library > Overview > Application Management > Applications, select the new application, select Deployment > Deploy and the Deploy Software Wizard will show. On the General page, Browse to a Collection and click Next. On the Content page, Add a Distribution Point (Group) and click Next. On the Deployment Settings page, select the needed deployment settings and click Next. Note: Select as Purpose Optional to let the user decide and select as Purpose Required to make it mandatory. On the Scheduling page, select the wanted schedule setting and click Next. On the Alerts Settings page, select the wanted alert settings and click Next. 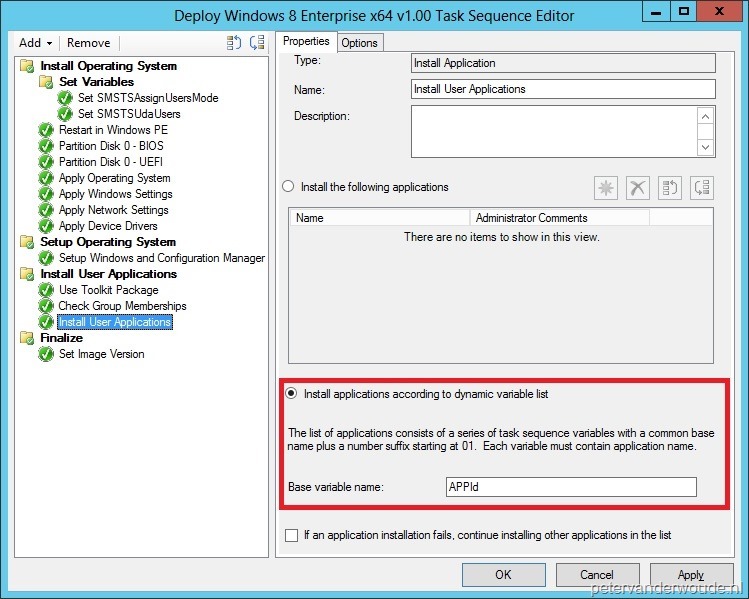 One of the new features coming with the Service Pack 1 release of ConfigMgr 2012 is the support for App-V 5. So what is a better way to try this feature then deploying the just released Microsoft Office 2013 Preview AppV packages in combination with the just released App-V 5.0 Beta 2 Desktop Client. But then the big question is, how can we deploy this? Well, I thought it was pretty straight forward, but there where a few caveats that everyone should know and pay attention to. Browse through the App-V package, with something like 7-zip, and look in the AppxManifest.xml at the DisplayName. 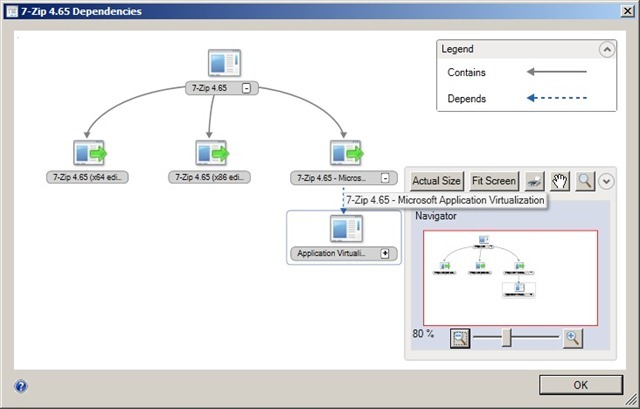 Open the App-V package with the Microsoft Application Virtualization Sequencer and look in the Properties tab at the Package Name. Now to adjust the Package Name use the second method and also save the Application Virtualization file with a shorter name. That was one of the biggest hurdles, as by using the same file name with a different Package Name it was possible to import the package, but the Deployment would always fail with a vague error. 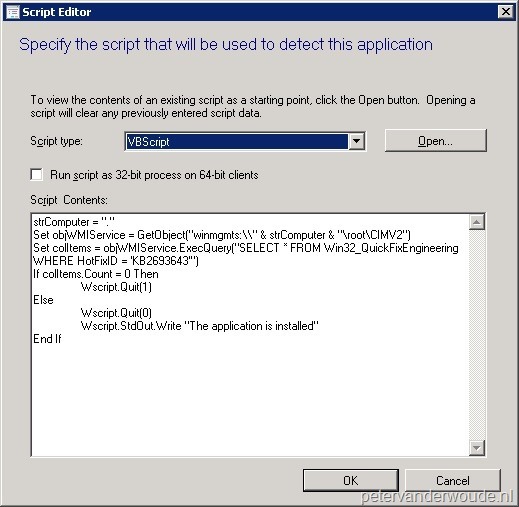 Change the key EnablePackageScripts in HKEY_LOCAL_MACHINE\SOFTWARE\Microsoft\AppV\Client\Scripting to 1. In my opinion is the first option the best option. As everything lately is powershell-minded, scripts should be enabled on the App-V 5.0 Beta 2 Desktop Client by default/ first installation. Now taking the two challenges and the prerequisites of the App-V 5.0 Beta Desktop Client into account, the dependency for my Microsoft Office 2013 Preview Deployment Type in ConfigMgr is the App-V 5.0 Beta Desktop Client and the dependencies for my App-V 5.0 Beta Desktop Client are PowerShell 3.0 and .NET Framework 4.0 (see picture). 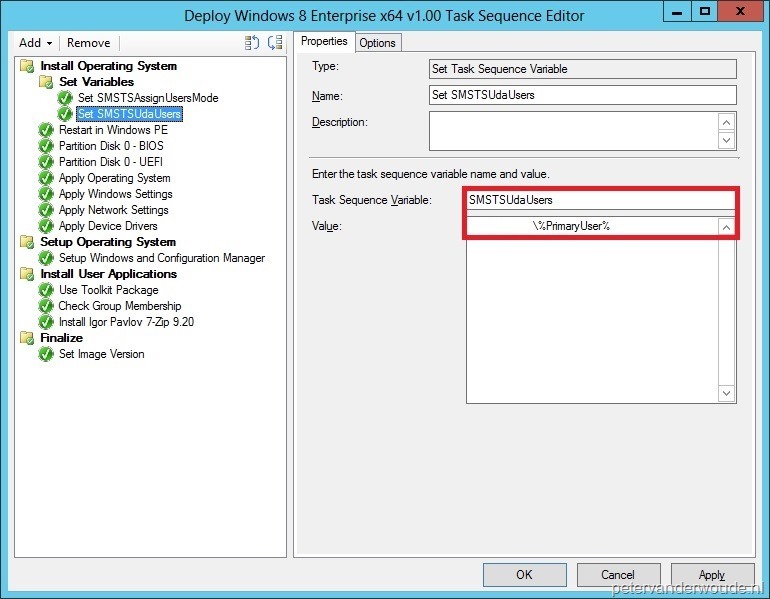 Also note that KB2533623 is also a prerequisite for the App-V 5.0 Beta Desktop Client, but as I don’t deploy that as an Application in ConfigMgr, I can’t configure it as a dependency. To be really sure whether it’s installed, or not, it could always be configured as a requirement. I didn’t do that either as it’s part of my base image of Windows 7. Another note would be to configure the detection rules for both PowerShell 3.0 and .NET Framework 4.0 good, as in Windows 8 they are both installed by default.